Mrs. Rose Markson Besdin of 10 Genesee Park Drive died yesterday. She was a life resident of Syracuse. Mrs. Besdin was active in local charitable organizations for many years. 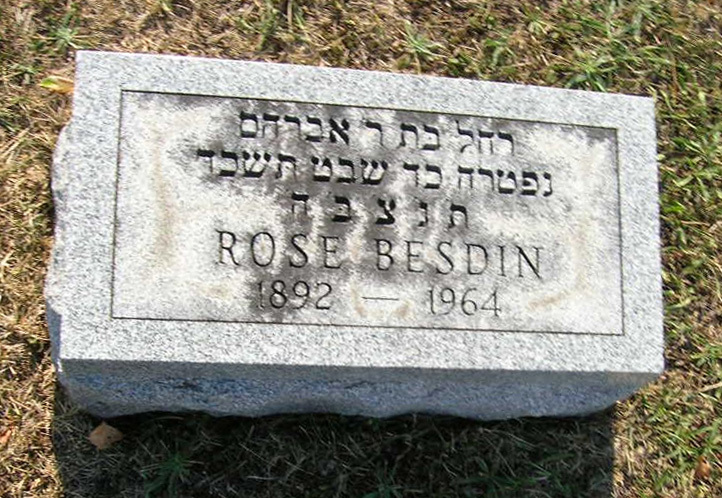 She was a member of Hadassah, the Auxiliary of the Jewish Home of Central w York, the Sisterhood of Temple Adath Yeshurun and Council of Jewish Women. Surviving are her husband, Philip L. Besdin: a son, Robert H Besdin. two daughters. Mrs. Jay Rudolph and Mrs. Richard Shiffner; two brothers, Henry Markon of Syracuse and Harry Markson of Auburn three sisters; Mrs. Max Franklin, and Mrs. Julius Gordon of Watertown and Mrs Louis Cohen of Los Angeles; and five grandchildren. Services will be at 11 a.m tomorrow at Birnbaum Funeral Home, Rabbi Irvin I. Hyman and Cantor Harold Lemer officiating. Burial will be in Adath Yeshurun Cemetery. Friends may call from. J to 9 p.m today at the Funeral home. 1309 E. Fayette St Following the funeral calling hours will be at the home of her daughter. Mrs. Jay Rudolph, 530 Scott Ave. Son, Robert Besdin; two daughters, Mrs. Jay Rudolph and Mrs. Richard Shiffner, five grandchildren.